Seattle made possibly the biggest move of the NFL off-season when they traded for former Minnesota Vikings wide receiver Percy Harvin. They signed him to a big new deal, cementing his place as a major part of the Seahawks offense for the foreseeable future. Increasingly, there has been conjecture on sports radio and among some local writers that the addition of Harvin, and now promising starts for rookie tight end Luke Willson and rookie receiver Chris Harper, will mean a drastic change for Golden Tate, Doug Baldwin. This Seahawks offense attempted fewer passes than any team in football last year, so how will they keep everyone involved? Some are already talking about trades. The logic of these conversations is sound, but the facts may surprise people. Seattle wide receivers had 2,370 snaps last season, according to the totals on FootballOutsiders.com. Sidney Rice led the way with 765 snaps, or 75% of the offensive plays. Tate was second with 715. Baldwin was third with 434. The next highest receiver was Braylon Edwards with 149. That would seem to support the myth. Look again. Ben Obomanu, Jermaine Kearse, Charly Martin, and Deon Butler combined for 307 additional snaps. That means 456 snaps were taken by receivers either not on the roster or unlikely to play this season. That is more than Baldwin received last year. Adding a player like Harvin will definitely shake up the distribution of snaps, but there are plenty of snaps to support a fourth receiver, even if the offense does not increase the use of three and four receiver sets or have more overall offensive snaps. Should the team get more snaps and use more 3+ receiver sets, which I anticipate, the total opportunities will only increase. There were 399 targets in the passing game last year. Targets are throws at a specific player, as opposed to completions. I prefer to focus on targets as it is a better measure of how often a team passes than completions. Again, Rice led the way with 80 targets. Tate was second with 68. And Baldwin was third among receivers with 49. All the other receivers combined for 40 targets. That total also nearly matches what Baldwin registered last season. The logical prediction is that the team will attempt even more passes this season now that Russell Wilson is allowed complete access to the playbook from week one. However, it is worth remembering that when the team caught fire in the last half of the season, they actually attempted fewer passes per game than they had earlier in the year. It still seems safe to predict a 10-20% bump in pass attempts in 2013. That, alone, should allow for plenty of breathing room in terms of receiver targets. The upshot of replacing those distributed targets with a player like Baldwin, Tate, Harvin or Rice is that the catch (receptions / targets) is bound to increase. The sum of those five other receivers was 19 receptions in 40 targets for a 47.5% catch rate. Baldwin, for example, finished with 29 catches in 49 targets for a 59% catch rate. That is how you raise the quality and efficiency of play. This one could have some fact mixed in with the myth. Only time will tell if the team decides to employ more three tight-end sets, but it seems unlikely given the team’s success in running the ball out of a two tight-end formation. The guy who may be looking over his shoulder is Anthony McCoy. I am a big fan of McCoy, as he is a very capable blocker and showed great strides in hanging onto the ball when it was thrown his way last year. His challenge is that he is an unrestricted free agent after this season, and it is hard to imagine the team will pony up what will be necessary to retain him. Zach Miller was on the field for 850 snaps, over 83% of the team’s plays in 2013. McCoy was second with 466, more than Baldwin (434). Evan Moore and Sean McGrath totaled 107 snaps as the third tight end. Willson or McGrath, whoever wins the third tight end job, will likely get more snaps than that in 2013, but that will likely come at the expense of McCoy and even Miller to make for a more even rotation. Miller will still get the lion’s share, but the rest may be more evenly divided and Miller may get a bit more rest. Where the tight ends may impact the receivers is in targets. Seattle threw to tight ends on only 21% of their throws last year. The Patriots are the other end of the spectrum. Even with an injured Aaron Hernandez and Rob Gronkowski last year, they still threw to their tight ends 28% of the time. That number was 39% in 2011 when both players were healthy. Seattle is not likely to match a rate that high, but it is reasonable to expect a shift of 2-5% going toward the tight ends. 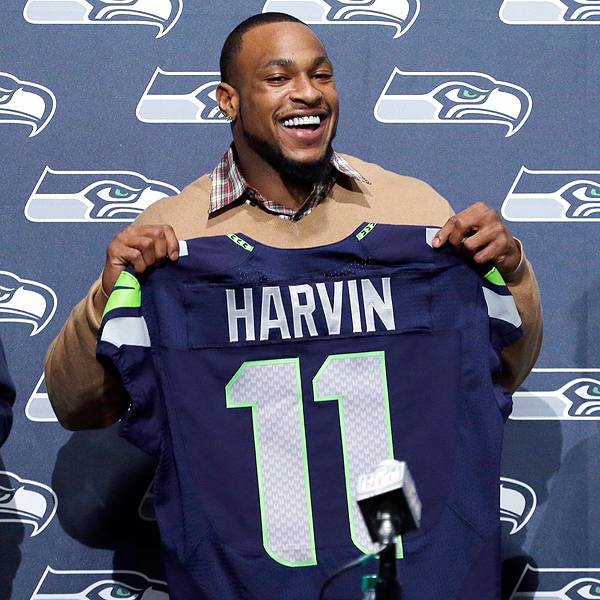 Harvin will get a fair share of time at running back. Look for a number of three receiver sets with Harvin in at tailback. He may take as many snaps away from Robert Turbin and Christine Michael as he does from either Tate or Baldwin. Adding a player of Harvin’s talent to a team is clearly going to impact the playing time and opportunities for other player’s on the offense. His addition, alone, is not enough to force one of the top three receivers from last year’s squad out of the rotation. There will be plenty of snaps and targets for players to make an impact, even if not to the level of receivers who play on more pass-oriented attacks. Many are far too quick to write off a player like Baldwin, who fought through injuries last year after leading the team in receptions as a rookie. Only five Seahawks receivers in franchise history have totaled more than his 80 receptions through their first two years in the NFL. Those are names like Joey Galloway, Brian Blades, and Steve Largent. Seeing that he is a restricted free agent next year gives the team little incentive to push him down the depth chart artificially. The true wildcard for the receivers will be the play of Harper. He can play outside, and is said to have some ability in the slot. Darrell Bevell would have to dial up a significantly higher percentage of throws for five receivers to get meaningful playing time. More likely, Harper will be a red zone specialist as a rookie, and be ready to seize more time in 2014. A lot of assumptions are being made in May that are being based on incomplete information. The most likely scenario to look for at this point is a far more efficient and potent four receiver rotation than the Wilson had at any time last year, making this offense that much more difficult to defend.